We update our Fundamental Conditions Barometer as we flip the calendar to September. After reaching 80 earlier this year, our Fundamental Conditions Barometer has settled in at “cruising speed” (see chart below). Last month we rebalanced the satellite portion of the Conquest Portfolios to reflect the Barometer’s reading of 50. Overall, trends in the data we monitor remain positive. Look no further than last Friday’s Durable Goods Orders for July. Excluding transportation July’s Durable Goods Orders grew 0.5% on a monthly basis while Core Capital Goods grew 0.4%. The labor market has also displayed signs of strength recently. After adding 209,000 jobs in July, expectations are for 178,000 jobs added in August (a sign that the economy may be nearing full employment), and the unemployment rate is expected to remain low at 4.3%. Our forecast for the remainder of 2017 is for continued growth. 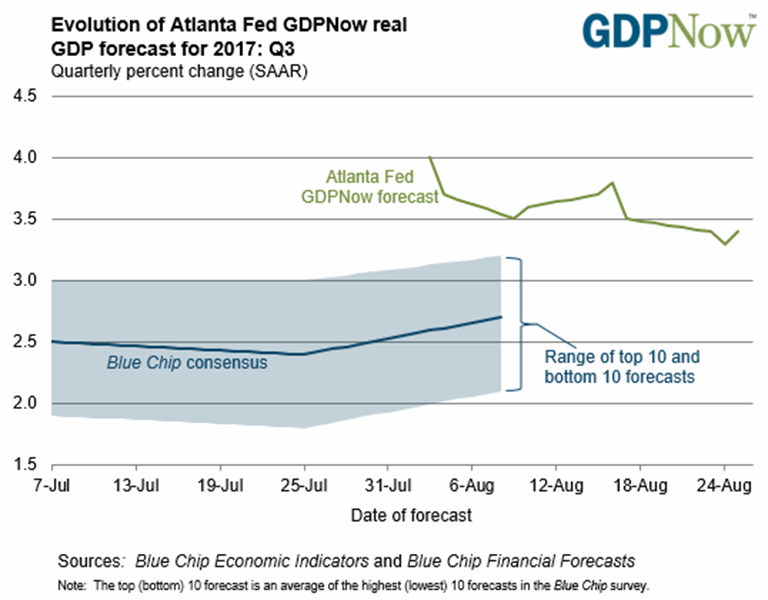 In fact, our forecast for 3% GDP growth is just below the Atlanta Fed’s GDPNow forecast of 3.4% (see chart below). Based on shorter-term expectations, the “tactical” allocation within portfolios is equally weighted between bonds and stocks. 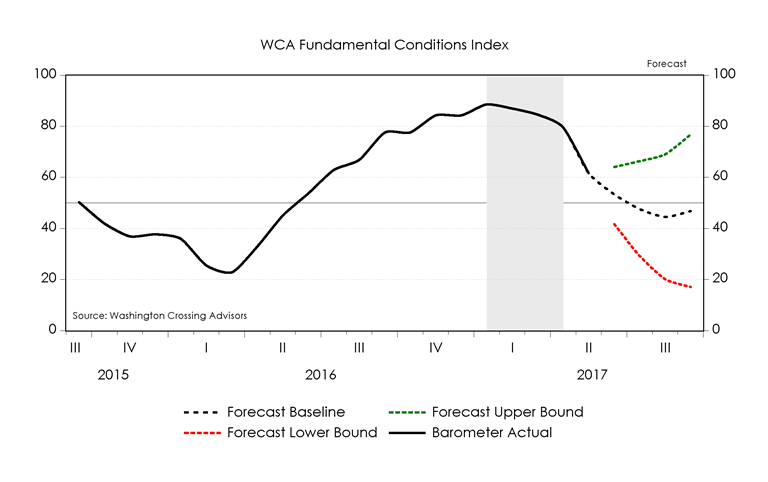 WCA Fundamental Conditions Barometer Description: We regularly assess changes in fundamental conditions to help guide near-term asset allocation decisions. The analysis incorporates approximately 30 forward-looking indicators in categories ranging from Credit and Capital Markets to U.S. Economic Conditions and Foreign Conditions. From each category of data, we create three diffusion-style sub-indices that measure the trends in the underlying data. Sustained improvement that is spread across a wide variety of observations will produce index readings above 50 (potentially favoring stocks), while readings below 50 would indicate potential deterioration (potentially favoring bonds). The WCA Fundamental Conditions Index combines the three underlying categories into a single summary measure. This measure can be thought of as a “barometer” for changes in fundamental conditions. Asset allocation and diversification do not ensure a profit and may not protect against loss. There are special considerations associated with international investing, including the risk of currency fluctuations and political and economic events. Investing in emerging markets may involve greater risk and volatility than investing in more developed countries. Due to their narrow focus, sector-based investments typically exhibit greater volatility. Small company stocks are typically more volatile and carry additional risks, since smaller companies generally are not as well established as larger companies. Property values can fall due to environmental, economic, or other reasons, and changes in interest rates can negatively impact the performance of real estate companies. When investing in bonds, it is important to note that as interest rates rise, bond prices will fall. High-yield bonds have greater credit risk than higher-quality bonds. The risk of loss in trading commodities and futures can be substantial. You should therefore carefully consider whether such trading is suitable for you in light of your financial condition. The high degree of leverage that is often obtainable in commodity trading can work against you as well as for you. The use of leverage can lead to large losses as well as gains. All investments involve risk, including loss of principal, and there is no guarantee that investment objectives will be met. It is important to review your investment objectives, risk tolerance and liquidity needs before choosing an investment style or manager. Equity investments are subject generally to market, market sector, market liquidity, issuer, and investment style risks, among other factors to varying degrees. Fixed Income investments are subject to market, market liquidity, issuer, investment style, interest rate, credit quality, and call risks, among other factors to varying degrees. This commentary often expresses opinions about the direction of market, investment sector and other trends. The opinions should not be considered predictions of future results. The information contained in this report is based on sources believed to be reliable, but is not guaranteed and not necessarily complete. Washington Crossing Advisors LLC is a wholly owned subsidiary and affiliated SEC Registered Investment Adviser of Stifel Financial Corp (NYSE: SF).